Our seeds are on a GrowJourney™, and they want to take you with them… To grow; to help make you happier and healthier; to improve your soil and the small piece of earth that you’re the steward of; to make amazing meals with your friends and family; to create new seeds that can be part of your garden and the gardens of other people in your community for generations to come. All of our certified organic heirloom seeds share an ancient history—stories of discovery, adventure and culinary delight that began many generations in the past. Your ancestors were part of those stories. And from the moment your first monthly package of GrowJourney seeds arrives on your doorstep, you will be too. We love our seeds and want you to experience the same sense of connection to your food that we do. That’s why we’re so careful about where all of the certified organic seeds in the GrowJourney Seeds of the Month Club come from and why we want to help you learn how to grow them by working with nature rather than against it, making yourself and the world better as you grow. 1. Do Organic Seeds Matter? Short Answer: YES! Organic seeds are better for the workers that produce them, the communities and ecosystems where the farms are located, the plants’ that are grown from them and the gardeners who grow and eat them (you). Long Answer: Did you know that seed crops (crops grown for seed production rather than food production) typically use far heavier doses of synthetic pesticides and fertilizers than food crops? This isn’t just bad for the environment and communities where these plants are grown, it’s “bad” for the seeds as well. Multiple, peer reviewed studies have shown that there appears to be epigenetic changes in plants grown in this type of environment that will cause their seeds not to grow as well in an organic garden or farm. How epigenetics works in people and the triggering of some common diseases (click image to enlarge). What the heck is an “epigenome”? 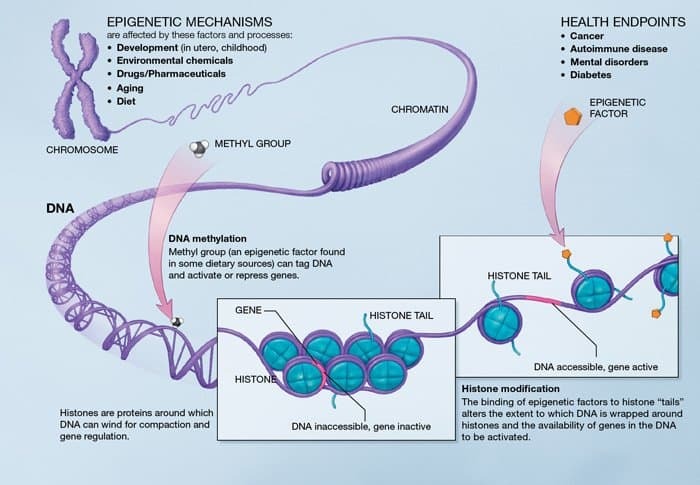 As the US National Institute of Health says, the “epigenome” is the array of chemical compounds that sit “above” the genome and tell an organism’s DNA what to do, where to do it, and when to do it. Think of DNA as a computer’s “hardware,” the epigenome as its “software,” and the environment in which the organism is grown as the “internet” to which it connects, communicates and responds. Adding another level of complexity to the amazingly interconnected, interdependent biological system that we call life, is the “microbiome,” a new scientific understanding that is overturning how we currently think about “individual” life forms. Like other complex life forms, only a small fraction of a human being (about 10%) is, in fact, human. We now know that people are walking, talking gardens comprised mostly of microbial life. As it turns out, the 90% of us is that is not “us” does not respond well to pesticides, antibiotics and highly processed foods. When our food gardens don’t feed our human gardens healthy, poison-free foods, bad things happen to the human beings in our communities (preventable mental and physical illnesses and diseases). Back to the epigenome…Unlike DNA, which is relatively fixed, a plant’s epigenome is immediately responsive to environmental factors such as drought, insect damage, soil quality and chemical exposure. Changes in gene expression (via the epigenome) can actually be seen within a single growing season and these changes are also passed down to future generations even though the plant’s DNA remains unchanged. So, what does all this mean? It means that the environment in which people and plants are grown is hugely important to their and their offsprings’ long-term health and productivity—arguably far more important than genes. If a plant is drenched in pesticides and synthetic fertilizers throughout its life, it will adjust to that environment rather than an environment where it needs to hone its natural insect and pathogen resistance/defenses while also optimizing itself to grow in organic environments that are teeming with a vast diversity of biological life (not to mention the impact that herbicides, fungicides and insecticides have on a plant’s microbiome). The long-term results from chemically-intensive crop production are weak plants and poor soil that requires ever-more applications of pesticides, fertilizers and other external inputs to continue to produce. So, if you want to grow food that isn’t covered with harmful pesticides and synthetic fertilizers, it’s important that you choose USDA certified organic seeds, e.g. seeds whose “parents” were grown in similar, organic environments. This approach will give you a big jump-start towards growing your own organic produce, which will ultimately help you (and your microbiome) be healthier as well. 2. Is GrowJourney Certified Organic? YES! GrowJourney is USDA certified organic by The Department of Plant Industry at Clemson University. It’s also important to understand that just because a company is selling open-pollinated or heirloom seeds, does not mean their seeds are organic. To read more about the important distinction between these descriptions and why they matter, please take a few minutes to read our blog post on this topic. 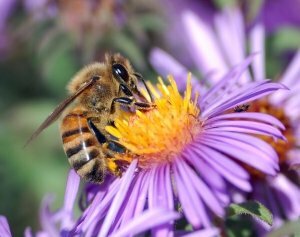 Our honey bees—which are essential for pollinating a huge percentage of our food crops—aren’t the only species going extinct. We’ve now lost most of the world’s crop seeds and are also in the midst of a man-made global mass extinction event. The good news? Each of us has the power to help remedy these problems. There are currently no GE/GMO (genetically engineered or genetically modified organism) seeds available for sale to home gardeners. GE seeds are a technology only available to commercial growers and farmers who buy them under exclusive technology license agreements. Many consumers are rightfully concerned about what they eat and how it was grown, and they are not always aware that they can not buy GE seeds for their gardens. Even though we are a certified organic gardening seed company, we still get a lot of inquiries from prospective members asking whether our seeds are non-GMO. That’s why we put the “non-GMO” labeling on our website (it’s more efficient than responding to a ton of emails). We also have philosophical and ecological concerns about the impacts of industrial agriculture and genetically engineered seeds on agrobiodiversity. For instance, over the past century, we have lost somewhere between 75% to 95% of our seed biodiversity forever. Think about this loss in biodiversity in terms of redundant strength: if you take five twigs banded together, they’re easy to break. If you try to break 100 twigs banded together, it’s much more difficult to break them. Biodiversity is one of nature’s—and thus humanity’s—keys to survival. We believe that seeds provide a genetic “library” that belongs to the commons, yet they’re increasingly being hoarded and/or eliminated by a small number of transnational corporations. Genetic modification and resulting DNA ownership consolidation will continue to reduce our food crop biodiversity, rather than increase it. The more “books” we all have access to via our shared plant genetic library, the stronger our global and local food systems will be. 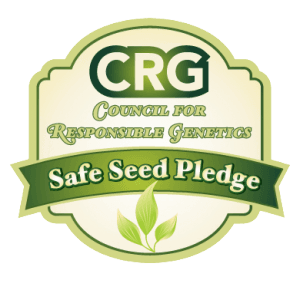 As such, we believe that each generation has a responsibility to preserve the seeds passed down from our ancestors while helping to create new seed varieties via traditional plant breeding methods (which are accessible to anyone). This practice helps increase biodiversity while fostering local, decentralized food production that is immediately responsive to changing environmental conditions and supportive of the unique cultures in which the foods are grown. Also, if seeds are thoughtfully grown using proven agroecological/organic methods such as permaculture, each yard and each farm where food is grown in the world can help restore or improve ecological health, rather than destroying it. That’s the future we want to help create, one seed and one person at a time…And we need your help to do it! What are heirloom seeds? While there is no clear agreement on the definition, we consider heirloom seeds to mean any traditionally-bred, open-pollinated cultivars that people save seeds from and share with others. “Open-pollination” simply means that pollination occurs via insect, bird, wind, humans, or other natural mechanisms. So what’s so important about heirlooms? For starters, think about our heirloom seeds as a genetic library. Heirlooms are the basis of every food crop we know and grow today, and they were “written” by and for farmers and gardeners (our ancestors) for thousands of years. It’s critical that we preserve that library. It’s also critical that those of us alive today help write new “books” by naturally breeding new, regionally-adapted open-pollinated varieties that will be tomorrow’s heirlooms. Also, studies have shown that our older, traditional seed varieties produce more nutrient-rich foods relative to modern varieties, which have primarily been hybridized to: 1) produce the largest possible yield per acre, and 2) be able to remain presentable to grocery shoppers after many weeks or months of transportation and storage. In the case of GMOs, the primary traits being engineered into the genomes of various crop plants are the ability of the plants to survive under ever-increasing quantities and varieties of herbicide and pesticide application (the companies selling the seeds also get to sell the various poisons that go with them). Virtually no regard has been given to the nutritional quality of the foods produced. When you also consider the fact that numerous scientific studies have concluded that organic foods offer substantially more nutrition relative to their conventionally grown peers, it’s clear that growing heirloom seed varieties using organic methods offers the best possible outcomes for the long-term health and wellbeing of people and planet. When you’re walking down the wrong path, “progress” is not continuing down the same path, it’s finding a new, better path than the one you’re on. Heirloom seeds tend to have a rich, cultural history behind them. Some heirloom cultivars date to prehistoric times while others may only be a few decades old. The range of sizes, shapes, colors, flavors, disease-resistance and other desirable traits available in heirloom seeds is staggering. By growing heirloom seeds, modern gardeners help conserve these shared libraries of genetic biodiversity while also writing their own, new pages in the living “history book” of each seed variety. At Tyrant Farms, we experience a profound sense of connection and joy when we learn about the “grow journey” each of our heirloom seeds has been on before it became part of our lives and part of our garden. Through the GrowJourney Seeds of the Month Club, we want to share that experience (and library) with you. 5. Why Do We Want You to Save and Share Your Seeds? Our seeds are not patented. Their genes “belong” to everyone and no one. We don’t employ lawyers to tell you what you can do with them. We WANT you to share our seeds and the harvest they produce with anyone you see fit. In fact, if you follow the growing and seed-saving instructions provided in our members-only GrowGuides™, each new generation of plants you grow will be even better adapted to your specific growing environment (soil type, rainfall, temperatures, etc) than their parent generation via natural epigenetic processes. As we’re beginning to realize, plants are far “smarter” than we give them credit for. Plants want to grow healthy, produce yields and reproduce prolifically so they (and the other organisms they support) can live on through their offspring. At GrowJourney, we don’t just want to provide you with great seeds, we want to help show you how you can naturally improve your soil fertility and let your soil food web dance with your seeds to get bountiful harvests. Growing food can be a beautiful, virtuous cycle that will benefit you and your plants alike. You can become part of this cycle—a steward—and invite others to participate too. Tip: sharing your seeds and homegrown organic produce with your friends and family makes a great invitation! 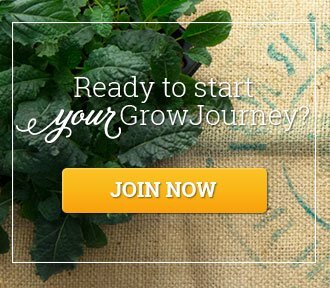 Ready to try GrowJourney risk-free?